Wisconsin offers power, style and a near complete outcross to the current offerings of quality Hereford Bulls. He is a unique combination of Polled and Horned genetics, offering a complete EPD package!!! 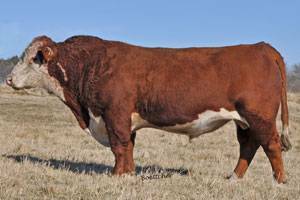 His dam is a full sister to the popular, high maternal, Shrek bull. 40W’s slam dunk calving ease that he has proven at Brookview Acres and for several other breeders will allow you broad spectrum use on cows and heifers!! !